Note: This page is archived from Mayday 2012, but you can rest easy, because we’re doing fun stuff for May 1st, 2013 too. 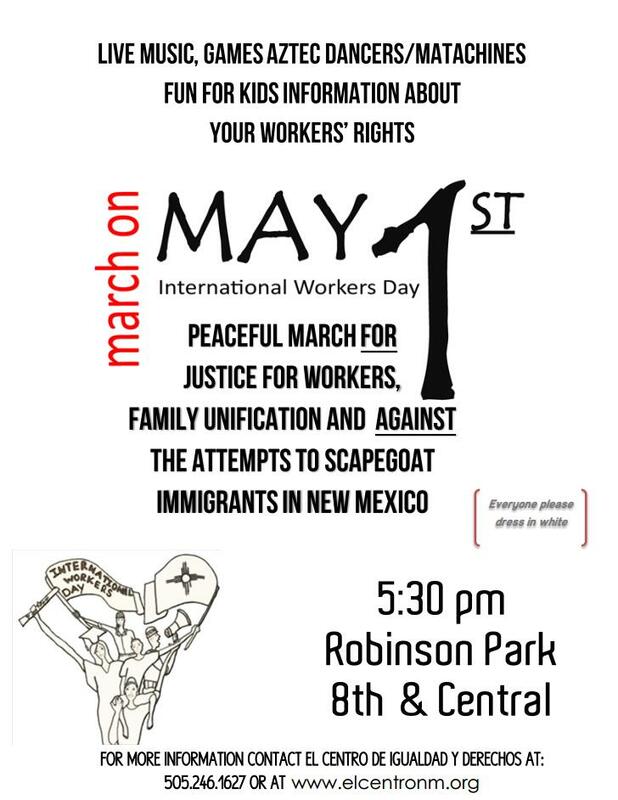 In solidarity with worker’s struggles around the globe, (un)Occupy ABQ, along with the Burque May Day coalition, will be conducting events on May 1st, the International Day of the Worker, to draw attention to the challenges faced by workers, the destructiveness of the capitalist system, and show what every day should be, bursting with art, fun, and life. The day culminates in the Walk to Cure Capitalism, which meets at 4:30pm at University & Central. 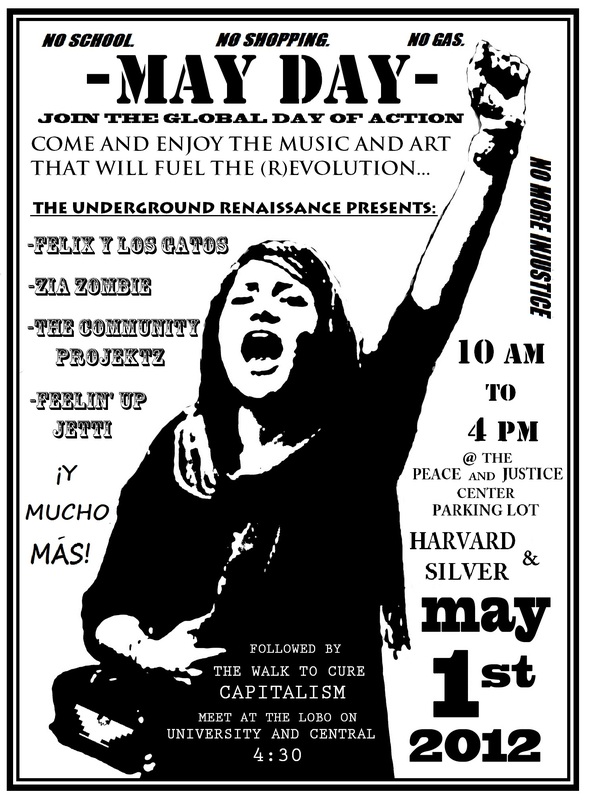 To fuel the revolution, there will be free performances by Felix y Los Gatos, Zia Zombie, the Community Projektz, Feelin’ Up Jetti, and many more, outside the Albuquerque Peace and Justice Center. (202 Harvard & Silver) At four the party will move to University at Central with speakers, art, music and games, to get ready for the march. Salt of The Earth, a film about the 1951 miner’s strike in SW New Mexico, will be screened at the Guild Cinema for $3. (Central & Tulane) The film was blacklisted, as were many involved in creating it, for alleged communist sympathies, but has since been renowned for being an realistic and powerful portrayal of organizing and the battles of women and workers for just treatment. Meet at 4:30p at the Lobo statue at the NE corner of University & Central. The march starts down Central Avenue at 5:30p with banners, chants, and song. Downtown, we’ll join with the workers day march and head to Robinson park with them, for music, dancing, activities, games, and teach-ins. El Centro de Igualdad y Derechos will be hosting their own worker event at Robinson Park. (8th & Central) It will include live music, activities, teach-ins, info about worker rights, fun for kids, and Aztec Matachine dancers. Their march will leave the park at 5:30pm and make a circuit downtown (where the Walk to Cure Capitalism will meet them) before heading back to Robinson. Their flier is available as a JPG, and as a bilingual PDF. Also, 350NM and 99% Spring (unaffiliated) will be sponsoring a no-cost direct action training by Joshua Kahn Russell at Immanuel Presbyterian Church. (Silver & Carlisle) The capacity is 175 people, with pre-registration advised, though not required.